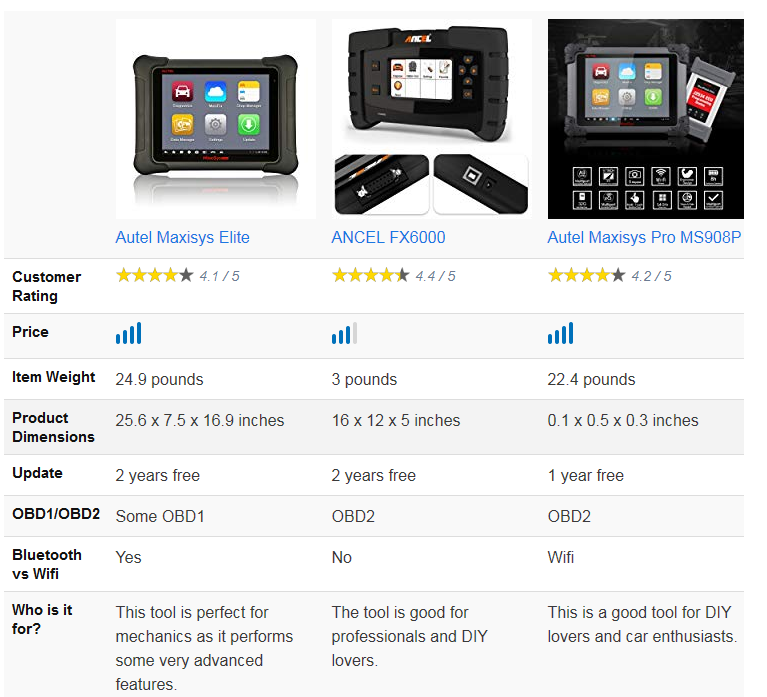 Autel Maxisys Elite Diagnostic Tool serves a personal mechanic for your vehicle. It helps diagnose both common and advanced car problems and provides help to fix them. In short, this obd2 scanner allows you to control your car’s components, engine, sensors, and systems wirelessly. It has a powerful battery, an efficient retina display with enhances the user experience. It won’t be wrong to say that getting an obd2 scanner to help you save several dollars by saving you a trip to the mechanic. Autel Maxisys Elite can perform ECU coding, IMMO, ABS bleeding, A/C initialization, Auto VIN, oil reset, and injector programming among others. * Reprogram your car using ECU programming using an interface that’s SAE J2534-1 & -2 compliant vehicle programming. * Secure your car using the IMMO feature to prevent engine start until the correct car key is inserted. * Depressurize system from the air by bleeding the brakes (ABS bleeding). * Use VIN technology to identify your car with a 17 character digit code. * See injector controls using injector programming. * Apply electronic parking brake when parking your car for added safety. * Filter out the soot that is generated in the engine using DPF technology and extend your car’s efficiency. * Reduce road shocks and improve driver control using SAS feature. * Match gears using throttle matching. Strength: 11 advanced features in just one scanner. Weakness: ECU programming is only for Benz and BMW. Autel Maxisys has a built-in NVIDIA Tegra”4 Quad-Core 1.8GHz Processor. It runs on Android KitKat which boots it up in mere 20 seconds. With such fast processing speed, you can perform tests and operations one after the other very quickly. Moreover, it also offers WiFi functionality and has a 13,600 mAh battery, which will make sure the unit keeps running for a good few hours. Strength: You will seldom see this beauty lag or freeze when overused. It connects via Bluetooth. Autel Maxisys doesn’t let you feel left out and offers amazing support. It has Autel Cloud Technology that lets you manage data, send and receive feedback anytime, anywhere. You can also easily find solutions to your problems as the tool helps you connect with several technicians, car enthusiasts. Plus, you can access an extensive data library that contains diagnostic tips, repair solutions. Weakness: Updates cost $695 after the first year. You don’t have to worry about any wires or connectivity issues because it operates wirelessly. However, it may be too heavy for some people t about 25 pounds. Strength: A completely mobile device. Weakness: Too big and heavy to hold in a hand. 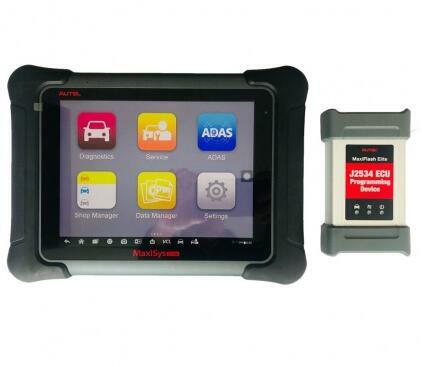 Autel Maxisys can work on most obd2 compliant cars and some obd1 cars as well. Strength: Supports a wide range of vehicles. Weakness: Some functions, such as calibrate seat sensors, may not work on some cars including Nissan and GM. 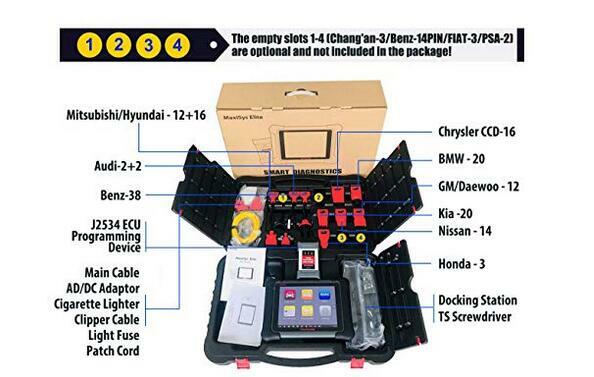 It supports 80 US, Asian, and European makes and models that are obd2 compliant. Updating the software is a breeze. You can do it via the internet by using the device. Who Is This Autel Elite For? Autel Maxisys Elite is a perfect tool for professionals because it offers many advanced and basic functions. It is an easy to use device, offers touchscreen technology, and eliminates the need to play with wires. Plus, it supports a wide range of vehicles including some OBD1 models as well. People who want to perform advanced functions such as programming, controlling the sensors and systems should buy this obd2 scanner. Autel maxisys elite might look way too expensive but it’s actually not if you look at the bigger picture. You’d be saving a lot of dollars when you buy it as you can keep your car in good condition with this beauty.